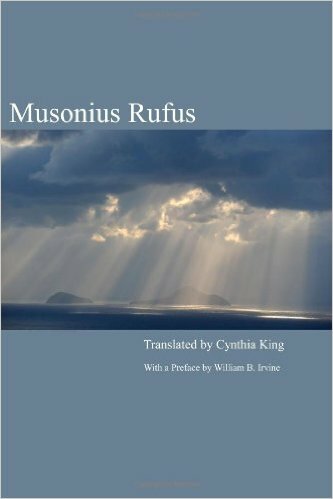 Time to take a look at Musonius Rufus, a preeminent Stoic in Imperial Rome, most famous nowadays for being Epictetus’ teacher (and thus an indirect influence on Marcus Aurelius). My notes in this post and the next are based on a new translation of the Lectures and Sayings by Cynthia King, which appeared with a preface by Bill Irvine. Musonius was a rather frugal philosopher, bent on practicality, as any Stoic would be. For instance, he said that “seeking many proofs on each subject, we should seek practical and clear ones. It is not the doctor who brings many drugs to sick people who deserves praise … but rather the one who helps them in a noteworthy manner with the few drugs which he prescribes.” I’d really like some of my colleagues to internalize this point, as academic discussions in philosophy do tend to ignore Musonius’ advice, to everyone’s detriment. Indeed, he goes so far as labeling “absurd and dull” those people who unnecessarily complicated arguments when simple ones would do — though I should probably refrain from such comment during the wine & cheese reception… That particular lecture concludes with a most Stoic reminder: “Only by exhibiting actions in harmony with the sound words which he has received will anyone be helped by philosophy.” Deeds, not (just) words. “women have received from the gods the same reasoning power as men … a desire for virtue and an affinity for it belong by nature not only to men but also to women: no less than men are they disposed by nature to be pleased by noble and just deeds and to censure things opposite these … why would it be appropriate for men but not women to seek to live honorably and consider how to do so, which is what studying philosophy is?” Why indeed. It’s very refreshing to read these words by a Stoic, since even in their time Stoics were not always at the vanguard in terms of gender equality. Then again, there is an unfortunately high number of people in the most advanced countries of the 21st century who still seem to think the above sentiments are outrageous. The fifth lecture goes back to one of the Stoics’ favored topics, which again will then be picked up repeatedly by Epictetus: theory or practice? While one could interpret this sort of passage as an example of how Stoicism counsels passivity and inaction, it clearly isn’t meant to do that. Musonius is talking about going through emotional pain in pursuit of things that are not worth it, like illicit affairs, money and fame. The reasoning doesn’t apply to things that are worth our efforts (even though they may be preferred indifferents), like love for our companion, or a public career that does good to others. Other lectures include standard as well as somewhat unusual Stoic topics, such as whether exile is an evil (nope); whether a philosopher should file suit against someone for assault (again, no); what the proper occupation for a philosopher should be (agriculture, it’s good for him! ); sexual matters (here he is a bit strict: only within marriage, and only for procreation purposes!, though at the least he states that men should maintain the same high standards of behavior as women); whether marriage gets in the way of philosophy (nope, see Pythagoras and Socrates); what diet one should follow (basically vegetarianism, using inexpensive and easily obtained food; gourmet stuff is explicitly ruled out); he even gives advice on how to furnish a house! (use nothing that is difficult to acquire or hard to use — ancient Stoics were bad for the consumer economy). This entry was posted in Ancient Stoicism on March 8, 2016 by Massimo. The last point has an interesting historical sidebar. Hadrian was just the second bearded emperor, and I don’t know what Seneca (the younger, of course) thought of beards, as far as why Nero grew one (of sorts), other than to look older. Hadrian, before wearing the purple, heard Epictetus. That said, Cassius Dio claims it was to hide facial scars, that Hadrian did this. Even if true to some degree, I suspect, if not specifically Stoicism, some sort of Hellenophilia was an additional cause. 41 Knowledge and opinion A Cicero, Academica 2.145 (SVF 1.66) [Speaker: Cicero on behalf of the New Academy] (1) Zeno used to clinch the wise man’s sole possession of scientific knowledge with a gesture. (2) He would spread out the fingers of one hand and display its open palm, saying ‘An impression is like this.’ (3) Next he clenched his fingers a little and said, ‘Assent is like this.’ (4) Then, pressing his fingers quite together, he made a fist, and said that this was cognition (and from this illustration he gave that mental state the name of katalēpsis, which it had not had before). (5) Then he brought his left hand against his right fist and gripped it tightly and forcefully, and said that scientific knowledge was like this and possessed by none except the wise man. Long, A. A.; Sedley, D. N. (1987-04-09). The Hellenistic Philosophers: Volume 1, Translations of the Principal Sources with Philosophical Commentary (Kindle Locations 6196-6203). Cambridge University Press. Kindle Edition. Musonius has been called the “Roman Socrates.” I admire him immensely due to his clear thinking and sensible use of logic in his accepted principles. He wasn’t always in alignment with his time but because he can think logically he was often ahead of it. Bravo Massimo for highlighting an oft-forgotten Stoic especially since he is arguably the greatest Stoic in practice. @massimo I agree. Early Japanese scholars wrote in Chinese. Writing in your own language was so, well, readable. Today’s philosophy seems to have lost its original focus. @labnut it’s been that way for quite some time. Read the late Pierre Hardot’s writings and you’d be amazed how far out philosophy has moved away from helping everyday life.